Featuring a highly adaptable design, the Intermec CK3 enables a variety of in-premise applications to reach their full workflow-performance potential. This improves their operational metrics, as well as simplifying IT support, and controlling operating costs. Contact us today about buying, servicing, renting or selling Intermec CK3 gear! The Intermec CK3 Mobile Computer is an ergonomically designed mobile computer built on the Microsoft® Windows® Mobile 6.1 operating system. 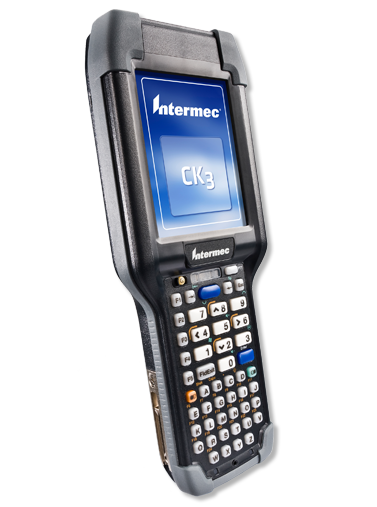 The Intermec CK3 is lightweight, easy-to-use, and runs most software developed for the Windows Mobile platform, including standalone, client-server, and browser-based applications. Intermec CK3 can refer to models CK3a, CK3a1, CK3n, CK3n1, and CK3NI, unless specifically stated otherwise. Contact us today about buying, servicing, renting or selling Intermec CK3 gear!